#USBS Ideal for banner stands and high defintion graphics. Weight: 360 gsm / 13 oz. 440 gsm 14 oz. Note: Smooth pvc vinyl banner material used for interior application and low stress outdoor application. USB is commonly used for retractable banner stand skins and interior retail aisle and point of purchase hanging displays. 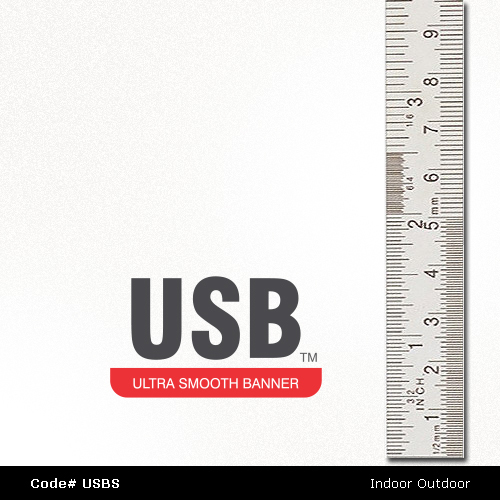 USB is a superior strength indoor / outdoor white matte scrim-reinforced material designed for display work. A smoother surface provides greater definition and is suitable for screenprinting and digital printing (grand format) systems. PVC banner material with a smooth and extremely flat satin surface designed for single sided printing whereby the inner high tensile round woven polyester yarn with UV additive and Fire Retardant treatment coated fabric shows minimall inner structure after printing. Select Bottom Tongue. Fit the graphic to the banner stand winder Choose hemmed edges, pole pockets, hook n loop. Select hemmed edges, grommet eyelets, pole pockets USB is a very versatile material for general signage. No special handling requirements. Wear PPE. No special storage requirements. Transport: US DOT Hazard Class: Not regulated. IATA/IMDG/RID/ADR/UN(not regulated/not classified). TDG (Canada) Foreign Inventory Status: AU(ACIS) CA(DSL) China(IECSC) PI(PICCS) EU(EINECS/ELINCS/NLPL) JP(ENCS) KR(KECI) NZ. PVC VINYL is not classified as a hazardous substance. Skin-Eyes: May cause mechanical irritation. Exposure Guidelines: Protect against hazards such as contact with high speed yarn. Eyewear: Safety glasses during processing. Inhalation: Not respirable in this form. Respiratory: An approved dust respirator should be worn. Ventilation: Thermal processing requires ventialtion of fumes and vapors which may cause irritation to the nose and throat. Ingestion: Not a probable route of exposure. Chronic. Experimental carcinogen. Chronic inhalation of dust can cause pulmonary damage, blood effects, and abnormal liver function. Ingredient Name: Poly(vinyl chloride), high molecuar weight. CAS Number 9002-86-2. Weight% >100. EINECS 206-625-7 Produced acc. to EN ISO No Heavy metals, PVC resins, phthalates of fungicides. Recyclable. No carcinogen properties listed. Appearance: Off-white solid or delustered fiber or clear to greenish resin. Physical State: Solid. Odor: Ink after printing. Solubility In Water: Insoluble. Incompatabilities: Normally Stable, Tends to dissolve in caustic materials. Hazard Symbols: None. Hazardous Decomposition Products: Chemical Stability: Reacts violently with F2. Ordinary temperatures sause slow dehalogenation producing hydrogen chloride. Conditions to avoid: Incompatible materials, dust generation, excess heat, strong oxidizing agents. Hazardous Polymerization: May occur. Toxicological Information: Not considered to cause irritant or allergic contact dematitis. Delayed: None shown. Disposal Considerations: Dispose in a manner consistent with federal, state and local regulations: No. Other Disposal Considerations: (hazardous decomposition products) Hydrogen chloride, phosgene, carbon monoxide, carbon dioxide. Toxic Substance Control Act (TSCA): Polymer is listed on the TSCA Inventory. RTECS CAS#9002-86-2:KV0350000. FIRE: Flame Retardant Din-4012-B1 USA NFPA 701. Draperies used in public spaces. 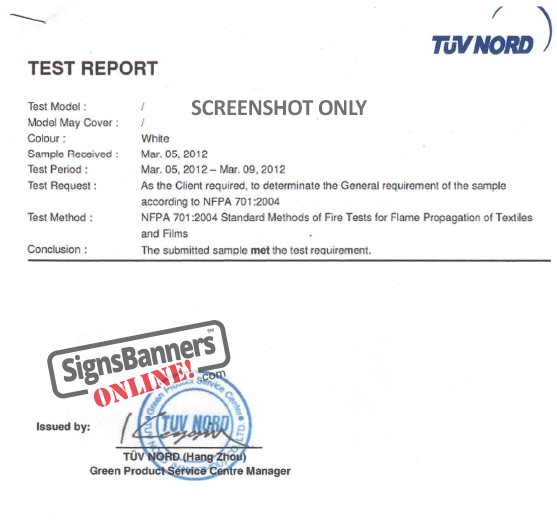 Test Method: DIN4102-1: Name of Product: PVC BANNER (suitable test) Conclusion: When tested as specified, the test results of the submitted samples not exceed the requirement of DIN4102. Fire Fighting Flammable Limits In Air: NA. Fire Fighting Media: Standard Agents, Dry Chemical Foam, CO2, Water, Spray (fog). Fire Fighting Equipment: Wear full bunker including self contain breathing apparatus to avoid exposure to smoke and vapors. Unusual Fire And Explosion Hazards: NA. Physical & Chemical Properties: Melting point 250°C. Decomposition Temperature: >350°C. Conditions To Avoid: Temperatures above 350°C will cause decompositions in the presence of oxygen. Solubility In Water: Neglible. Chemical Stability: Stable. Incompatability: Incompatible or can react with strong oxidizers, bases and acids. Material Fibers are coated with minor quantities of finish oils. Textile processes may volatilize portions of these finishes and produce visible misting in the workplace. Ventilation is recommended to minimize exposure to such finish mists which should not exceed a concentration of 5 mg/m3 ACGIH TLV for mineral oil. SBO does not warrant banner materials for the following: Seamed in order to make a large banner. Ripping, tearing or damage due to the effects of the weather or environment or installation. Tension: Do not apply tension to the banner. Too much tension may damage the material; therefore keep the tension under 7kgf. PVC VINYL banners are/maybe coated with ink. Textile printing processes may volatilize portions of these finishes. The inkjet ink prepartion isn't classified as dangerous and it contains no hazardous material after curing during normal handling and operation. At tempertures between approximately 130-190°C the applied finish may evaporate or decompose. Residual solvents post 128 hours: 0.05%.